In 1734 a vastly extravagant silver wine cistern was made (it took four years) for Henry Jernegan and his customer Littleton Poyntz Meynell. It weighed nearly 8,000 ounces (about a quarter of a ton) and is now in The Hermitage, St. Petersberg. It is arguably the largest item of 'domestic' English silver ever made. The two men disagreed and the cistern was held by Jernegan who needed to recoup some of his losses. He chose to offer the cistern in a lottery and each £5 ticket sold was accompanied by a silver medal. This is one of those medals. The medal was designed by H.F. Gravelot and cut by John Tanner of the Mint. 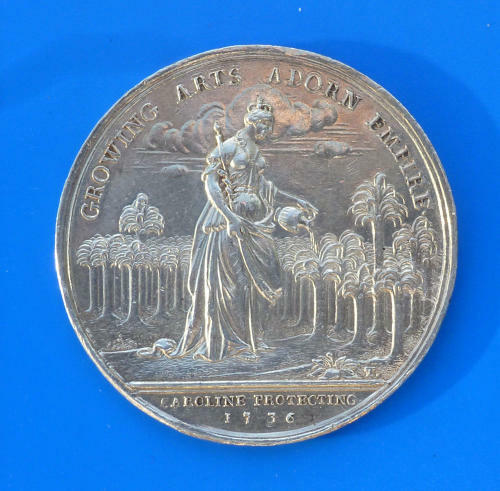 It depicts Minerva with spear and palm branch standing between a pile of arms and emblems of the arts and sciences on the obverse, and on the reverse, Queen Caroline watering a grove of young palm trees, referring to her well known love of botany, as well as the nurturing of ‘green shoots’ of knowledge. The third image is of the cistern.